Thank you to each and every customer who has taken the time to review their WOW Scotland tour on TripAdvisor – we are delighted to have received 1000 amazing reviews! To celebrate, and to thank everyone who has helped us to reach this impressive milestone, we are delighted to announce that we have donated £1000 to five local charities (well, actually £1250, but that doesn’t have the same ring to it!!) These charities all provide services which have been instrumental in enabling us to provide a warm welcome to our customers. WOW Scotland has donated £250 to each of the following five charities; Dornie and District Community Hall, the Wardlaw Mausoleum Trust, Staffin Village Hall, Knockando Woolmill Trust and Scotland’s Churches Trust (St Andrew’s Cathedral in Inverness). Each of these charities provides useful and much-needed facilities for tourists: The Dornie and District Community Hall offers public toilets which we use on our Isle of Skye Day Tour; The Wardlaw Mausoleum is an exciting attraction which we regularly visit on private Outlander tours; Staffin Community Trust provides toilet facilities and is a key facility in the northern Skye; the Knockando Woolmill Trust provides excellent tours of their facility for customers on our Highland & Speyside Explorer Tour; St Andrew’s Cathedral is a beautiful place of worship whose facilities are used by customers on our Invergordon shore tours. Whilst ourselves and our customers do make donations and purchases at these facilities when we visit, we are keen to show our appreciation by providing one-off larger donations too. 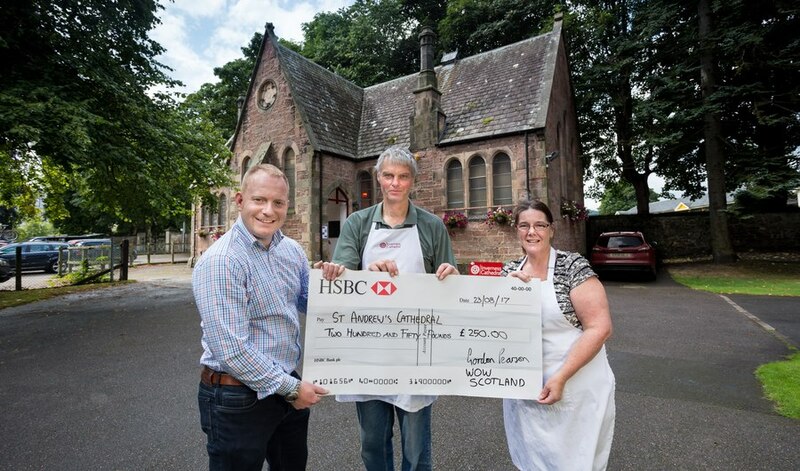 Gordon Pearson, Director of Tour Company WOW Scotland (left) presenting a cheque for £250 – to the Wardlaw Mausoleum Trust – recieved by Erik Lundberg – voluntary Custodian. (right). The presentation gift – one of several to various Highland charities and organisations linked to tourism, marks the point that WOW Scotland have now reached 1000 reviews on Trip Advisor. Location – inside the Wardlaw Mausoleum at Kirkhill, near Inverness. Gordon Pearson, owner of WOW Scotland commented that, “In celebration of so many happy customers, we are delighted to be able to give something back to the organisations who are working hard, on a charitable basis, to provide services to tourists in the Highlands. Tour logistics can be a challenge, and providing an excellent service to our customers would not be possible without organisations such as these”. As we continue to work hard to provide excellent tour experiences we look forward to celebrating the next 1000 happy customers!